OOTD - Blush Maxi Skirt | La Petite Noob | A Toronto-Based Fashion and Lifestyle Blog. It's the start of a long weekend here in Canada, our Victoria Day weekend, and it's chilly! The temperature has taken a nose dive and we in Toronto must dress accordingly to save freezing off our behinds. This poor blush maxi skirt - originally purchased to be a breezy summer outfit staple must again be paired with a long sleeved knit (seen here as well.) 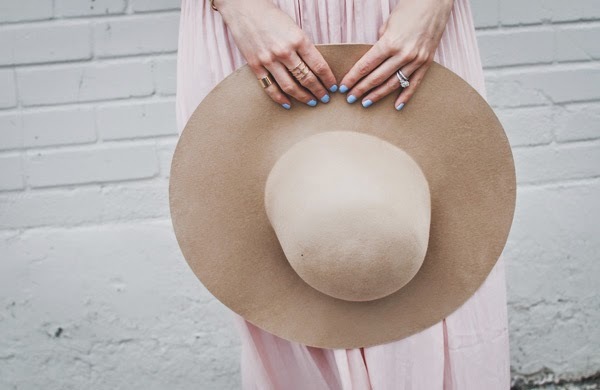 What's a Noob to do other than plop on a floppy wool hat, grab a sweater and say a small prayer to the sun goddess for warmer weather to come soon. Read on for additional outfit photos and details on how I styled this blush maxi skirt for the cooler weather. Am I the only one who goes through life with a constant hair elastic on their wrist? Happy Victoria Day long weekend to all of my fellow Canadians out there! Love that skirt, it's the perfect length. I actually love incorporating pastel into my winter wardrobe. Such a pretty skirt, love the pastel color and the flowy material! I am in love with blush right now! I think it looks sophisticated, yet still gives off a girly vibe. Blush is one of my favourites as well - so much so that I have to talk myself out of buying every piece of blush clothing I see! I'm glad that I'm not the only one with a contestant hair elastic on their wrist, haha! I absolutely love blush, pink original any pink variant!! This outfit is so perfect for sunny spring days... I love it to bits!! And so affordable!